The classic cruise ferry Sardinia Regina has a capacity for 1700 passengers, 400 cars and features all the amenities of a modern ship. Onboard you’ll find a selection of en-suite cabin accommodation, seating lounge, cinema, selection of bars, shop, a la carte restaurant, cafeteria, sun deck with swimming pool, children’s play area and a video games room. The cabins on the Sardinia Regina are all above the car deck, in a selection of inside and outside (sea view) and are en-suite. Onboard the Sardinia Regina you’ll find an a la carte restaurant affiliated with the famous ‘Chaîne des Rôtisseurs’ – a guarantee of quality. For something more relaxed there is a self-service restaurant/cafeteria. 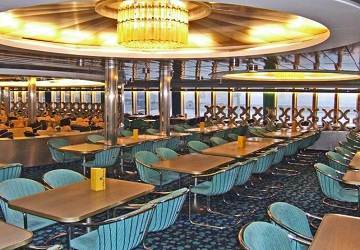 There’s a choice of 3 bars too – Cocktail bar, panoramic bar and an outdoor bar on the sun deck. In addition to the swimming pool, you’ll also find a cinema to keep you entertained during the trip. Children are well catered for onboard the Sardinia Regina in the form of a dedicated play area. There is also a video games room for the older children. Please Note: Whilst we have taken great care in making our Sardinia Regina guide as accurate as possible, onboard facilities, services and entertainment may vary depending on the date and time of year that you travel, facilities mentioned may change without notification and ferry companies reserve the right to operate vessels other than those mentioned at time of booking without prior notification. Great trip, friendly crew, fast rough sea support services. Outbound and return very punctual. Great trip. 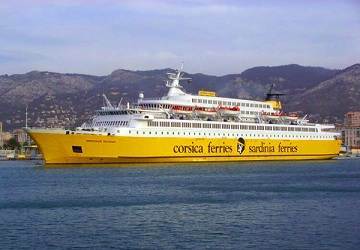 "Corsica Ferries Savona to Bastia"
Ship was on time, the load and unload went very efficiently. Well organized harbor crew. Ticket price for the two trips was very reasonable. Add more seats. Instal few free water dispenser.. To swallow two tablet I had to buy a bottle of water. For the second time we travel with Corsica Ferries from Savona to Bastia with the camper, Comfortable and fast journey, friendly and helpful staff, the only drawback was the supporters of the Bastia soccer club. It was a nice crossing with Sardinia Ferries. Good service and there was also a swimming pool. Very good organisation. Very fast boarding. The food in the restaurant was really nice and in good price. You have to arrive to the port at least 45-60 min before departure. Bastia-Livorno the ferry left the port 2 min before the departure time . You need just the booking number with you. Have anice trip! Staff was rude and not very professional, very good service in the garage, good cleaning inside and bad outside. Perfect journey the outbound one. The return insteas was a kind of mess, we arrived in Golfo Aranci at 8pm. The departure was a 8.30pm. The harbor was deserted. We asked information to a man there and he told us that all the departure were moved to the Olbia port. No one from the agency informed us. So we run to Olbia and we embarked ath 8.20 and the ship has sailed 5 minuts after... Next time would be nice of you let us know this kind of stuff (like who purchased the ticket directly with Sardinia Ferries). apart from this everything went well. Really pleasant experience on upper sun deck with bar and music and a piano bar inside. Very efficient and good value. Only disappointment being that foot passengers were, unusually, let off last which added another, unnecessary 40 minutes to the trip. If you are traveling from Bastia do give yourself at least an hour before departure as you have to both collect your ticket at the port (which may take time) and then get a navette to the ship. The crossing was fast and comfortable, restaurant and bar prices too expensive. There is no coordination between the ferry company and the local transport in Golfo Aranci. There were no trains or bus to Olbia at 6.30 pm when the ferry arrived, so I took a taxi and it was really expensive. Nice trip for all of us. The ferry was on time on the route to Golfo Aranci, but a littlle bit late on the Livorno route. "Golfo Aranci -Livorno, 17th of September"
"additional cost at the port"
during the check in at the port they asked us to pay 107€ for the extra width of our camper, just because on the website I couldn't do it. "Good trip and good efficient service on board"
Efficient check-in: all you need is a copy of your voucher to go on board, without collecting the tickets. Excellent facilities on board. Very friendly staff, everything is fast and easy. Even the toilets on the main deck were clean after so many people got seasick during the crossing. Savona is a very nice harbour and so easy to reach from the highway!